He’ll do it again and again and again! Take a look at this picture. I promise it isn’t just a random blurry set of pixels taking up space. This is me, Amanda, in early November of 2015. Looking closer, ever so closer, you can see the start of something so precious, so beautiful. You see, right in the middle of this seemingly pointless ultrasound picture is the very beginning of our beautiful son, Callen. This picture was taken at a clinic when I was (according to OUR dates) approximately 6 1/2 weeks pregnant. Where’s the baby? That’s all I could think. He or she should be there. We should at least be able to see him. There was no visible baby. 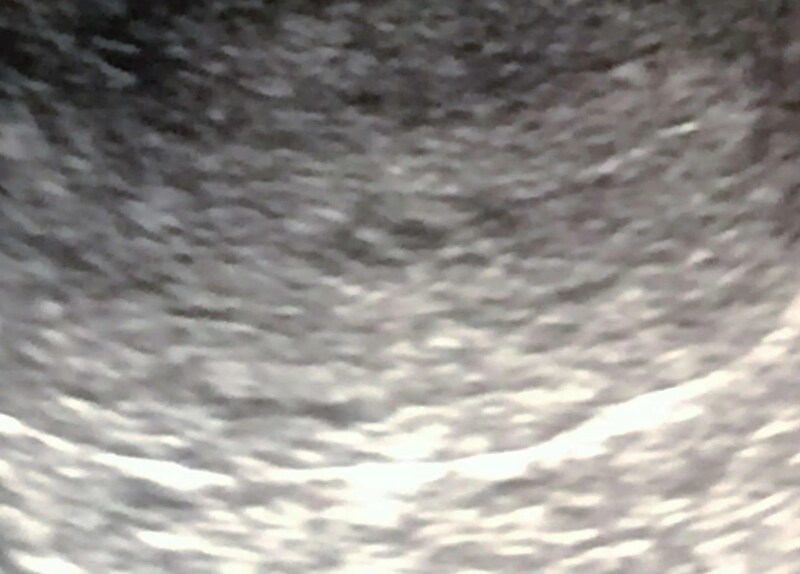 The ultrasound technician uttered the words I still get nauseous about writing… “I’m so sorry…” . No, not again. Please, God. Please no. PLEASE let this baby be there. PLEASE let him or her grow. We desperately want this baby. That was the most desperate prayer and the most vulnerable I’ve felt in prayer in a very long time. 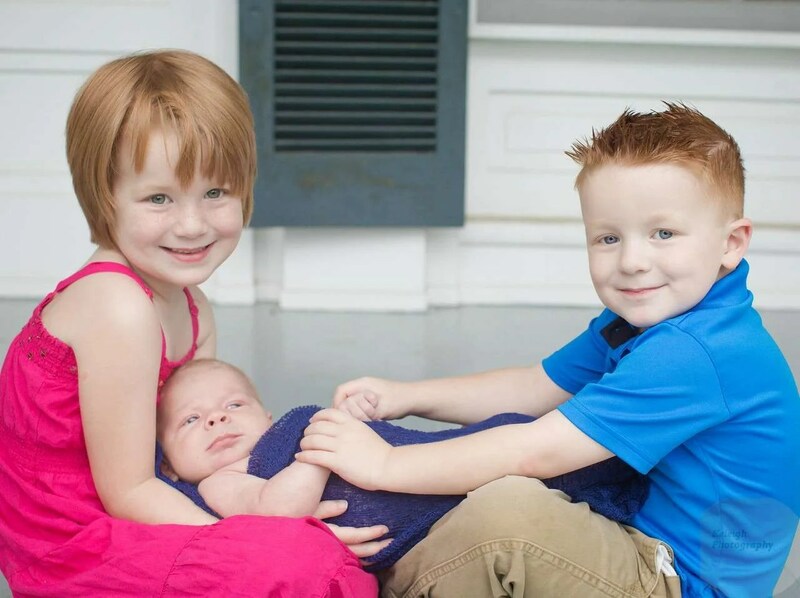 My husband and I were blessed with two amazing children at this point, Keelyn and Kavan. We wanted this baby SO badly though. We additionally have three babies who are in heaven. We’ve unfortunately had three very early losses, but no matter how early or how late… they were our babies too. At this point in this pregnancy, I had an OB appointment set up already. I’m pretty sure I called the day after I confirmed the at home pregnancy test (for literally the 10+ time) and told my husband. Excited was an understatement. I saw the words written on the sheet at discharge from the clinic I attended for the above ultrasound: No proof of intrauterine pregnancy. I knew it wasn’t over. It just had to NOT be done. I told VERY few about the pregnancy. In fact, I think it was just a friend or two from church, my husband (obviously! ), my former guardians back home, and a couple co-workers. 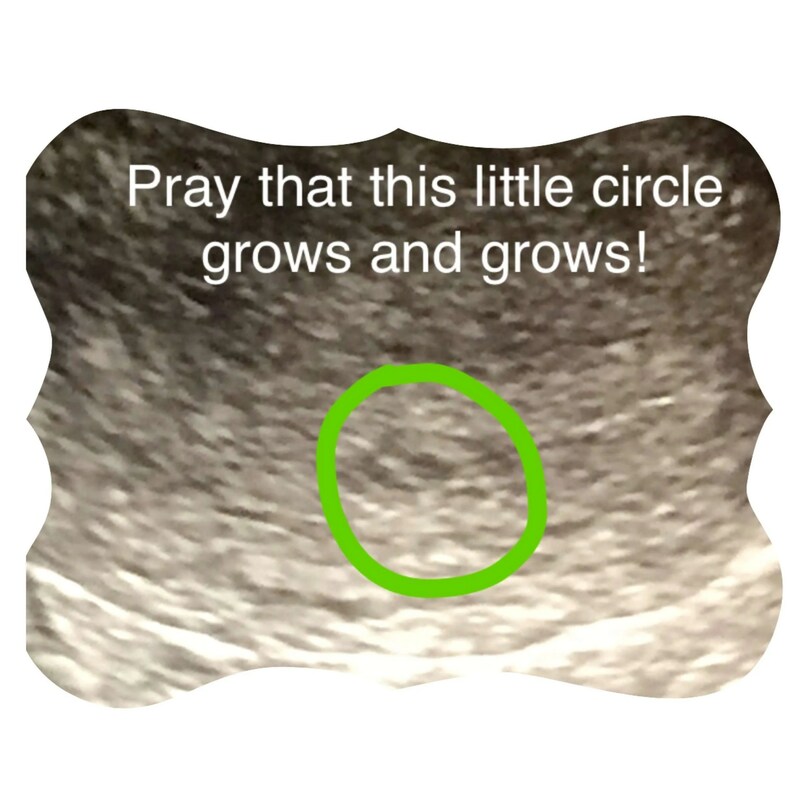 I sent them the ultrasound image below with the sweet circle highlighted and asked everyone to pray that it grows. Waiting the 2 1/2 weeks until my ultrasound appointment with my OB felt like something I can’t even describe using polite words. It was HARD. I was so anxious, but at the same time so hopeful. I probably wasn’t the happiest or most joyous person to be around. Heart pounding and breathing rapidly, I was prepared for the procedure that would let me know if prayer had done its thing. Is there a baby there? I had a sinking feeling. My husband did a WONDERFUL job at reassuring me, but I’d always have that thought… Yeah God, but how can he be so sure? He doesn’t REALLY know. Ultrasound machine was turned on and it was go time. She poked and prodded and moved my organs around (it sure felt that way!) before she FINALLY spoke. Okay, here’s the gestational sac. No baby yet. PLEASE let that baby be there. Okay, here’s the yolk sac. WHERE’S THE BABY? Oh please, God. Please. I know we’re not in the best of financial situations and I know I’ve made mistakes, but PLEASE. Before I could finish my prayer and as my heart was about to beat out of my chest… And here’s your baby. Look! There’s the start of Callen right there. 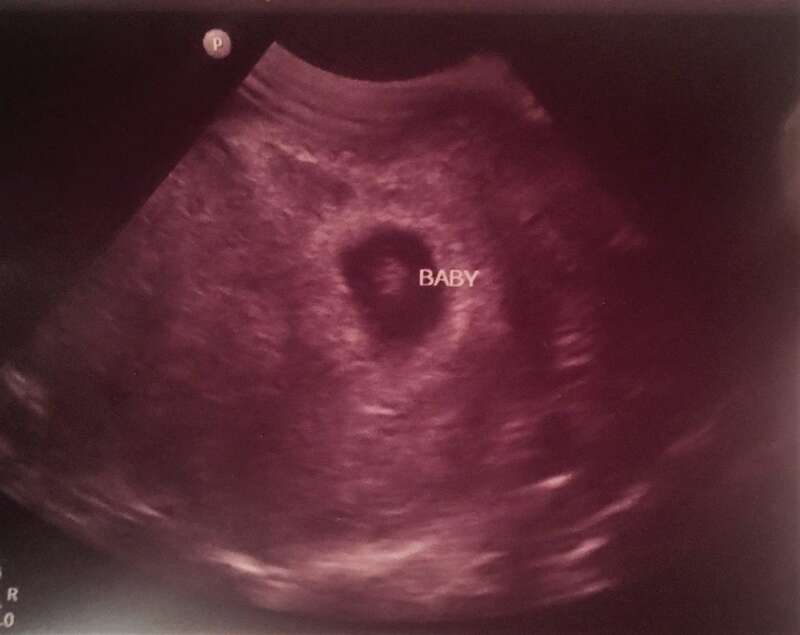 I’ve never thought the word “BABY” looked so beautiful, seeing her type it on the ultrasound screen and seeing it on the photo in my hands. Even now, I feel that way. Thank you, God! YOU ARE FAITHFUL! You heard my cries and my prayers and you actually did it! I was in disbelief, but man was I thankful. We weren’t able to hear the baby’s heart at this appointment, but we could SEE it start beating. Gosh, what a beautiful, amazing sight. After the appointment, I sent a group text to the same group of people I’d asked to be praying to let them know that the baby grew and grew and GREW. What a change for just 2 1/2 weeks! The pregnancy progressed and with the exception of (jokingly) disagreeing with my AMAZING doctor about my dates – everything was fine. I’ve had 3 losses, but the pregnancies we’ve been able to maintain have been wonderful. O’Reilly 3.0 as we called this baby grew and actually caught up to the dates we had originally thought, rather than that of the ultrasounds shown above. We tracked dates near religiously. Due to our losses, we knew. Keelyn came at 39 weeks induced. My husband was military and this worked for us. He was able to be here and she was happy, healthy, and PERFECT! She weighed 8 lbs 7 oz. Kavan came at 38 weeks and 2 days on his own. He was literally the most pink, beautiful baby! He weighed 8 lbs 3 oz. So, by that logic, Callen should have arrived mid-late June. But… we had to go by the OB’s dates, which was fine. I trust him FULLY and would recommend him to anyone. So, Callen’s labor inducement began July 5. Now, by my dates… I’m almost a week overdue. I’d never been THIS pregnant. I arrived at the hospital just after midnight and got all hooked up, medications administered. When it was GO time, I pushed our beautiful boy into the world in 7 minutes. 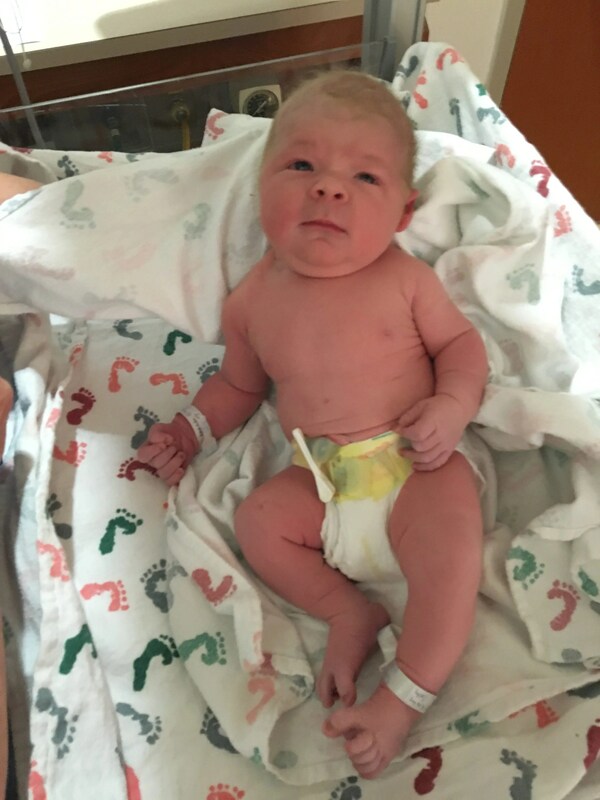 Meet Callen Adriel O’Reilly! He arrived at 12:09 pm on July 5, weighing 10.3 lbs and 22.75 inches long! Isn’t he perfect? His name was picked because of its meaning. Callen means “rock” or “firm”. Adriel means “follower of God”. We pray this is truth for our sweet boy. Such JOY has Callen brought to our family and all who know him! He’s such a happy baby and is “easy”. 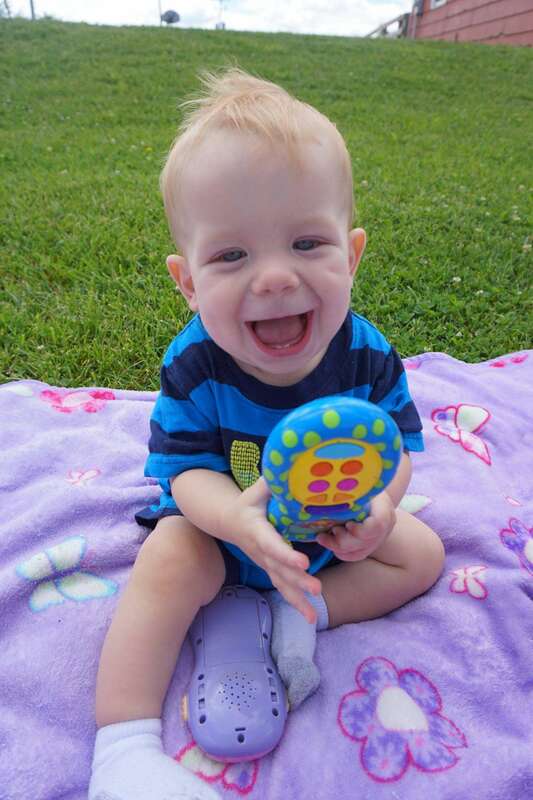 He loves eating, smiling, talking, playing with his older brother and sister, and loving on his pets. His smile? Y’all, he has dimples for DAYS. His smile makes all the junk and mess and muck of the day just melt away. His snuggles are off the charts amazing! Here’s the thing… Our God knew him. He KNEW my baby. He knew him before he was even formed! When we saw nothing more than a blur of white, gray, and black on the ultrasound screen… he knew Callen and knew what he would grow to be. When it was hard to hold onto faith, God was still working. He was still intricately piecing together our baby and using this situation to move me closer to Him. His timing, y’all. It’s everything. Little did I know at the time that we would be leaving (and later returning to) our church, which was such a huge, scary, big ordeal. It was rough. But I felt peace through Him. It was HARD at times. One of the hardest things I’ve ever had to deal with. I suppose I had just enough faith to get through. Praise God for that. Before I formed you in the womb, I knew you. Before you were born, I set you apart. Jeremiah 1:5. I reread the chapter in which this popular verse is contained. I find that it’s important to do so, so as to not take the verse out of context. In Jeremiah 1, we see the call of Jeremiah. God is telling Jeremiah that he is called to be a prophet. We can read scripture to know that this is true. He wrote Jeremiah and Lamentations. In fact, Jeremiah served as a prophet during the reigns of kings Josiah, Jehoahaz, Jehoiakim, Jehoiachin and Zedekiah. Jeremiah was scared, y’all. He told God he was “too young” in verse 6. God was there. He reassured him. Right then and there, God “put words into” Jeremiah’s mouth (verse 9) and asked Jeremiah to report his vision. Whoa. Friends, I know there are so many situations we encounter that truly test the very fibers of our faith, our connection with Him. It gets REALLY difficult at times. We may want to give up. Sometimes, you know what… we DO give up. Guess what? That’s where God really can move and do His thing! He wants us to rely on Him. He wants us to know that HE’S GOT THIS! It’s a vulnerable feeling, but also beautiful in that we can rest assured that He is there and always will be. He’ll be there and He’ll move the mountains again and again and again if we need. Oh, how He loves us! He is jealous? For ME? Think about that for a minute. Really think about how THE Creator of the universe, the Father of our salvation, the very same God who spent time with Adam and Eve, the same God who sent HIS son to die for us… He’s jealous for you! So often, we sing songs about how big His love is for us, how much He cares, how much He wants us to go into deeper waters to trust Him. Question… Do we ever really THINK about those words? Bigger question… Do we BELIEVE those words? Give some honest thought to that. Our day to day lives are filled with SO MUCH stress, so much tugging and pulling to do everything and be everything to everyone. We get weighed down with anxiety and stress and all that junk really starts to cloud our minds. Maybe it’s just me? I recently was BLESSED to take my Emmaus journey. What a blessing! To be able to take three days to be with like-minded folks focused on our amazing, great big God was absolutely everything my heart needed. It was all I had hoped it would be… a beautiful time where I was able to refocus on Him and his amazing and unconditional love for us. So, God has blessed me with really letting me hear Him through music. Those lyrics that we sing really allow me to hear Him and to be in His throne room with him as if He is speaking directly to ME. We sang several songs throughout our journey to Emmaus of course. It was amazing being able to worship with my sisters (and a few brothers!) together. Several songs stood out, one being – as you may have guessed it… Crowder’s “How He Loves”. That first night, I spent quite a bit in silent meditation and prayer. At several points, I just spoke those words above over and over – again, meditating on words from this song and others. You see, prior to Emmaus – life was stressful. (Well, hello there understatement!) It’d been a crazy year of transition after transition. So, Emmaus was SO needed. It’s so true how things happen in HIS timing, right? I was “supposed” to go a year or so prior – but “somehow”… it didn’t work out. This time, I was able to build a relationship with a different sponsor and met some Jesus-lovin’ folks that I wouldn’t have gotten to meet otherwise (shoutout to my “Mama” here!). I started thinking about all the junk that had transpired, not just the past year – but much longer than that… how He was always there. He was there when I felt like no one was. He was there, fighting for me, crying with me during hard times, yearning for me to lean on Him. Sometimes I did, other times, in my own pride… I tried to do it myself. He was still oh so faithful and never left me. He never forgot about me. He was there, with open arms. He may have been thinking “I told you so.”, but He never made me feel less than. He loves us SO big. SO unconditionally. He loves us in such a way that NOTHING we do, NOTHING can change how He feels about us. It’s a sacrificial, unconditional form of love that truly beats all odds. Wow. The same God who created the Heavens and Earth loves me like that? Really? Can I be honest here? So many times, I feel unworthy. Those stinkin’ happenings in life REALLY get to me. I mean, they may or may not be getting to me as we speak. But ya’ know… God has MY back! Life can really make us feel like we are nothing. Stress with kids? Job? Family? Feeling friendless? Finances? Marriage? Maybe it’s all of the above. For many people, it is. I’m currently feeling a few of the above. We can’t let the enemy win our hearts by allowing him to invade our thoughts. No matter how low, how down, how alone, how useless, how whatever I feel… I remember that He loves me as I am and He loves me FIERCE! He has my back! That same God who’s done such great and mighty things goes before me in battle and he will never leave me. I can rest assured that I am not alone, because He lives in my heart! Friends, I beg of you… know that YOU ARE LOVED. I mean it. No matter your mistakes… You’re loved. God thinks you are PRECIOUS. You were made in His image… you’re beautiful and valued and cherished beyond belief. When you feel any amount of “less than”… know that you’re worth more than all the treasures of this earth. QUIZ: Contemporary Worship or Love Song? From ChurchPop.com – Can you correctly guess if these songs are Contemporary Worship Songs or Love Song? QUIZ: Contemporary Worship Song or Love Song? “Our God is greater, Our God is stronger, Our God is Healer, Awesome in Power” – YES, He is AWESOME indeed. May you enjoy worship with this song today…. Worship is an experience like no other. As we asked for feedback about Replenishfest, we were repeatedly told that festival attendees enjoyed the community of worshipping together. Many remarked that it didn’t matter what color your skin was or what denomination you related most to. It was a time in which people could freely worship. When people come together to worship, they are individuals representing a different season and story of a life, a different background, a different journey. And God knows each story and journey. During those times of worship, God may be healing the hurting, encouraging the weak, mending, loving, freeing those who come and lay themselves down before Him at the alter. No matter what the individual differences there are – physical, emotional, spiritual – when we worship together, we are united by the One True God. Our common unity creates community. And through that community, people encourage and pour into each other offering love and hope, obeying the commandment to love others as you love yourself. When you tear down the walls of division, you find you have a vast community that extends far and wide. It can sometimes be mind-baffling as to why we often choose to segregate ourselves by denominations and doctrine. In Matthew 14 when Jesus feeds the 5000, did He first say to separate themselves per their divisions? No, He fed them ALL by performing a miracle. The one thing they had in common was coming to hear the Word from Jesus. Come together and worship… this would be our hope for the new year is that we would put aside our differences and come together to worship, to hear the Word and be fed by the Holy Spirit Himself. Are you hungry for God’s love?